Laylocks was started by Martin Warr at Laylocks Cottage, on Broadheath Common. After having trained at Pershore Horticultural College, Martin was soon successful and found the nursery running out of space. More land was required and in 1981, the present site was purchased, and work started to prepare the nursery. Martin and the Laylocks team have always prided ourselves on our commitment to quality. We decided we wanted to grow the majority of the plants sold at Laylocks on site, to insure the highest quality. Roses were planted during the next few years, a time when Laylocks,supplied many other Garden Centres. A house-building project was also fitted in for Martin and his wife, Lynne. This was the start of a new marriage and set to become a lovely family home filled with memories. This year, we saw the first extension to the retail greenhouse. The business has steadily grown since Martin started his adventure. This showed a huge increase in the plants, which are grown on site, to be sold to the public and not other Garden Centres. Martin noticed that fashions were changing in the Garden Industry and a concept of ‘lifestyle Gardening’ was beginning to take place. Noticing this, he wanted to be able to offer the public the services and products they needed. 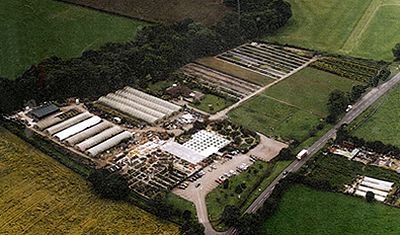 With this in mind, Laylocks started to move from predominantly a Nursery to a Garden Centre. As the transition from a Nursey to a Garden centre was in full swing, we began to see a large increase of retail customers, resulting in us having to increase our indoor retail area and our outdoor plant area. As a result of the previous years, the car park had to be extended to deal with the increase of customers. 21st Birthday for Laylocks Garden Centre!